Hi Everyone! I am so blessed with receiving this book. 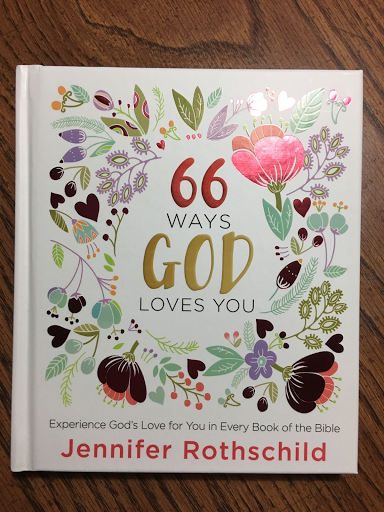 "66 Ways GOD loves you". Experiencing God's love for you in every book of the Bible. This couldn't have come at a better time. The sermon series we started at our church a year ago was to go through all 66 books of the Bible. Our Pastor is preaching one sermon from each book. Looking at each one as though it is a love letter to us from God. While reading this book and thinking of past sermons I was thinking this book is "half late", hehe - no seriously though this has been great and quite a few pick up on the sermons we've heard. There are times that we need to be reminded that God knows us, sees us, and loves us no matter what. We are now into The Gospel of Mark. In Mark we learn that God stills the storm in our souls. There's no storm more powerful than your God. He does care when you feel you may drown beneath the heartache of it all. His love can calm your heart even if His will chooses not to calm the storm. Sometimes He lets storms remain to teach you something in the waves or build up your strength at the oars. Sometimes the very storm you are going through is what God is using to cleanse you and carry you to a better place of deeper trust. When the storms come at you, trust God's peace to ground you. When waves of fear, anxiety, doubt, or stress threatens to wash over you and take you under, hold tight to Him; He is in the boat with you! He will take you to safety! He will bring you back to peace!! I really enjoyed this book. I highly recommend it for gifts for friends and family. I read this with my son, he enjoyed it as I have.